It’s a delight to create make this asymmetrical knit cape from a piece of beautifully textured wool knit remnant courtesy of purplemaroon. It features a half collar, diagonal zipper and hooks, and fringe details. I have started to take flamenco classes since last year. Flamenco dancers always look passionately amazing. This asymmetrical knit cape design is inspired by shawls worn by female flamenco dancers. The textures of this knit piece is perfect for fall or winter time. Moreover, this is my first zero waste DIY project! *At one corner, the knit piece was cut out in a shape resembling a quarter circle. I didn’t want to waste any of the knit piece, so I played around with it on my dress form. The cape shape materialized quickly, with the half collar detail and diagonal opening. So I went forward with it. First, I fixed any imperfections (small holes or loose yarns) that I could see on the wool knit piece. Then I made a small dart near the right shoulder to better shape the neckline. After marking the zipper placement, I put the zipper in place with the black stiff cotton fabric as stabilizer. To make the zipper not visible from the outside, I added five eyelet and hook fastenings along the diagonal opening, approximately 3″ distance from one to another. Last but not least, I sewed the black fringe on the front hem, intentionally letting out a 5″ space as a right arm opening. Olé! I really love this asymmetrical knit cape. Special thanks to Josephine of purplemaroon for letting me have this wonderful remnant! During one particularly cold winter night, I wore this cape with my flamenco skirt peeking underneath, and it looks amazing! I look forward to wear it with my daily outfits one of these days, whenever it’s cold and/or windy outside. 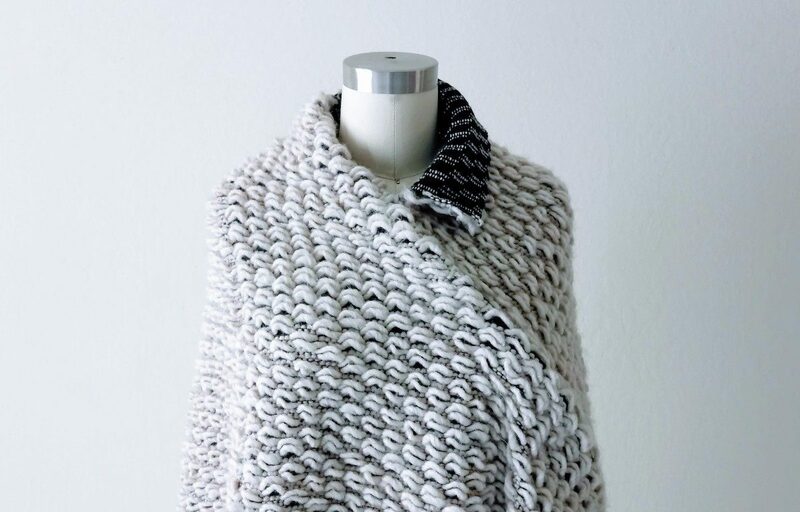 Asymmetrical knit cape draped from a piece of beautifully textured wool knit remnant. It features a half collar, diagonal zipper and hooks, and fringe details.